Amazon’s November 2014 update for recent Kindle devices* is a big’un, and Kindle owners have yet another reason to love Amazon (ignoring the fact that this new feature should’ve come a long time ago). 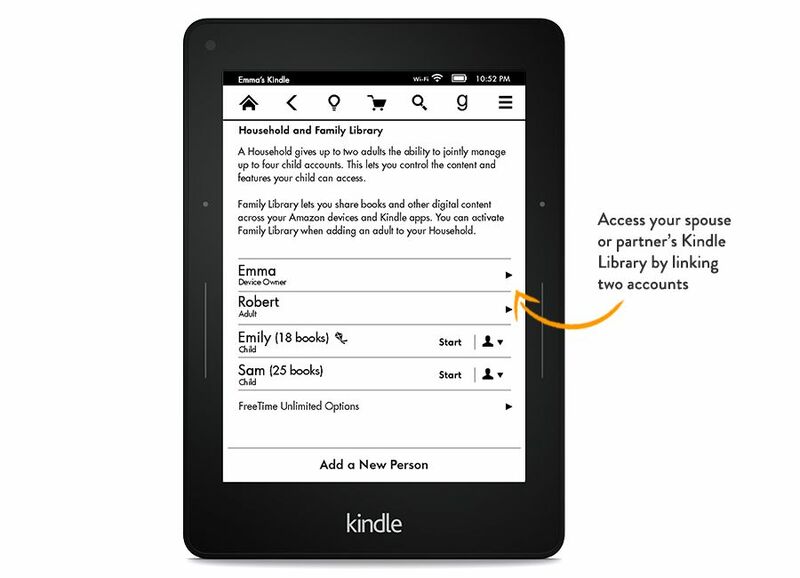 Kindle Family Library enables two adults to share their entire libraries with each other across devices/accounts, and with no need to “Lend” often unlendable books from Big Pub. With this step forward, the Kindle experience inches closer and closer to the coveted state of full paperbackification (if I may) — that point in time when one can no longer cite what they’re missing by not owning a book’s physical edition … besides, of course, the fact that they do not own the book’s physical edition. An e-book can never decorate a bookshelf in your living room, but if that (and the smell) are all that’s left lacking in the comparison chart, Amazon can proceed to drop the mic. I just set this up on my Kindle and the wife’s, and sure enough, the home screen library/cloud on both devices shows all ebooks that either of us have ever bought. I immediately went on a download spree on both Kindles, loading each of us for upcoming trips. The kids can get in on the action, too, (I think up to 4) and parents can control what they can see/not see, manage “Free Time” for those with equally book-obsessed offspring. The above and a bunch of other new features are in today’s Kindle update. One that I personally appreciate is the ability to immediately buy/download the next book in a series upon completion. 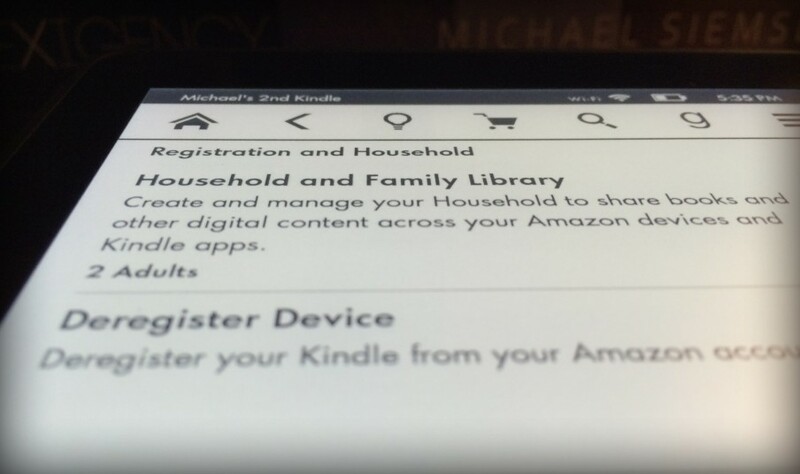 No need to go out to the Kindle Store – just two taps and you’re on to the next. Matt Turner sends his love, Amazon. 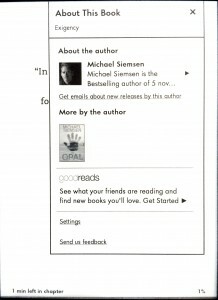 Another potential boon for authors is a new About the author function that pops up the first time you open a book. You’ve got a little thumbnail image, the author bio from Amazon, and a list of other books by the author that aren’t already loaded on the Kindle. 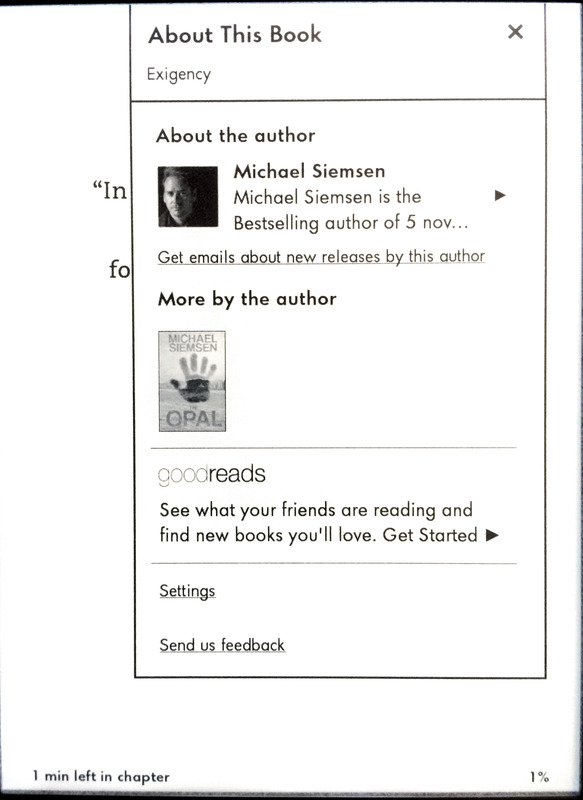 I like the “Get emails about new releases by this author” link, but it would probably be better placed when you are done reading the book. Or, hell, why not both? If your Kindle’s wi-fi is enabled, you should receive the update some time soon, but I just went to the Kindle updates page, downloaded both files (one for Kindle Paperwhite 2nd Gen, one for Kindle Voyage – each device requires it’s own specific file), connected to my computer via USB, dragged and dropped file into the root storage (not one of the folders), wait for copy, safely eject device, then go to Settings, Update Kindle on the devices. Done in five minutes. So what are we still missing? So tell me, what’s left? What are we still missing? “The paper book experience” just doesn’t do it for me. Yes, it’s familiar, there’s an object in your hand, it has a texture and scent, but for all the times I struggled to read in the dark back seat of my mom’s car on the way home, or drained a flashlight’s batteries, or flew somewhere with 14 pounds of extra weight and bulk in my backpack, or wished I had brought a different book somewhere (like to the bathroom)—for all those times, I say nay. It is not a superior experience. It’s just what we’re used to. *This update is only for the Kindle Voyage, 2nd Gen Kindle Paperwhite, and the latest base model Kindle. I checked my Kindle app for iOS, and it appears Amazon is definitely limiting this functionality to new Kindles to sweeten the deal of owning one. Hopefully, this will expand later, as Amazon has always been big on the content provider aspects, and not just hardware.